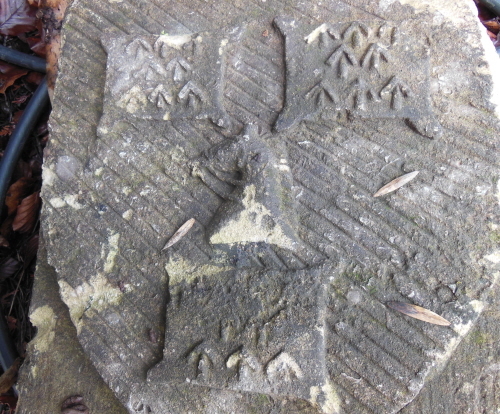 Earlier this year I was contacted by Richard Crook, of the landscape architects Portus & Whitton, to see if I could identify some heraldic stonework unearthed in land that was once part of the kitchen garden of Edgeworth Manor, Gloustershire. A trawl through Burke’s General Armory looking at Arms associated with the surnames of various owners of Edgeworth Manor was not conclusive. The closest match was for Hopkinson of Lofthouse, Yorkshire “Vert three pillows ermine“. That hinted towards Edmund Hopkinson who bought the manor in 1832 and died in 1869. Richard then advised that Edmund’s father was George Caesar Hopkinson of Wootton Court who had served in the King’s Light Dragoons. The Harleian Society’s Grantees of Arms made mention of a Grant of Arms to a Lt Col Hopkinson of Wootton Court in 1823. Unfortunately, I could not find any mention of the blazon in any of my reference books or on the Internet. 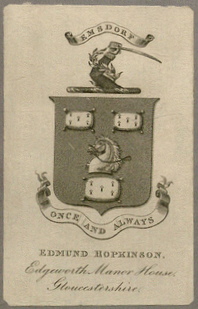 After numerous searches I did manage to find a rather poor quality image of Edmund Hopkinson’s bookplate. That at least was sufficient evidence to confirm the identity of the stonework. 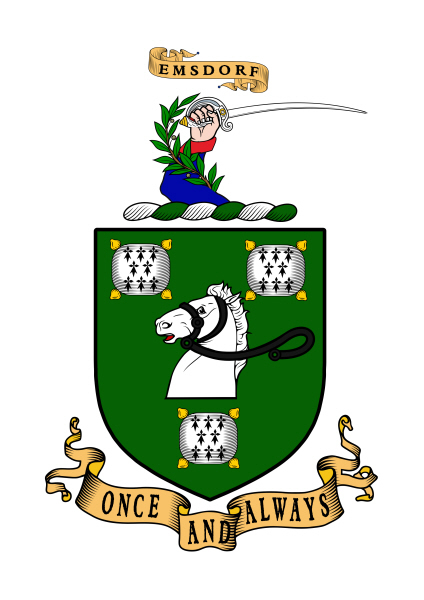 The arms are blazoned Vert a Horse’s head couped Argent bridled Sable between three Cushions Ermine tasselled Or and the crest on a wreath of the colours (ie Argent and Vert) A dexter Arm embowed habited Azure cuff Gules (being the Uniform of His Majesty’s aforesaid 15th Regiment of Dragoons) the hand grasping a Sabre the Arm entwined with a Laurel branch all proper and in an Escocheon the word EMSDORF. Below the arms is inscribed the motto ONCE AND ALWAYS (Coll Arm ms Grants 34, 10). I had not realised that the Battle of Emsdorf, in which the 15th Light Dragoons played a major role, was the first instance of a battle honour being awarded to a British Regiment. I am a bit puzzled by the blazon for the crest because the various pictures of the 15th have them with red sleeves and blue cuffs.